Published: March 1, 2013 at 06:23 p.m. Updated: March 3, 2013 at 12:31 p.m. It's official: Joe Flacco isn't going anywhere. Fox Sports insider and NFL Network contributor Jay Glazer reported the Baltimore Ravens have agreed to terms with the quarterback. He's expected to sign the deal Monday. The Ravens were prepared to franchise Flacco if a deal wasn't completed by the start of free agency. There was no way they would let him hit the open market. NFL.com's Albert Breer reported that Joe Flacco's deal is for six years and would make him the highest-paid player in the NFL -- making it worth more than $120 million. The deal is expected to be finalized Sunday night or Monday morning. 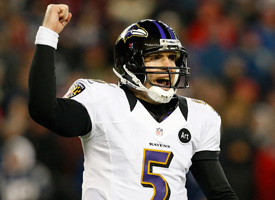 Flacco will be in Baltimore on Monday to sign the deal, according to Breer. The Baltimore Sun reported the deal will net Flacco $120.6 million, for an average of $20.1 million per year, with a total payout of over $60 million in the first three years. New Orleans Saints quarterback Drew Brees previously held the distinction of NFL's highest-paid player with a five-year, $100 million contract, including $60 million guaranteed, signed last year. NFL.com's Ian Rapoport reports that Flacco found out that the Ravens had agreed to agent Joe Linta's contract offer while he was watching television. There are only seven starting quarterbacks in the NFL with a Super Bowl ring, and Flacco is one of them. The numbers will be big, and Flacco called it before the season when he said the price tag would only go up.